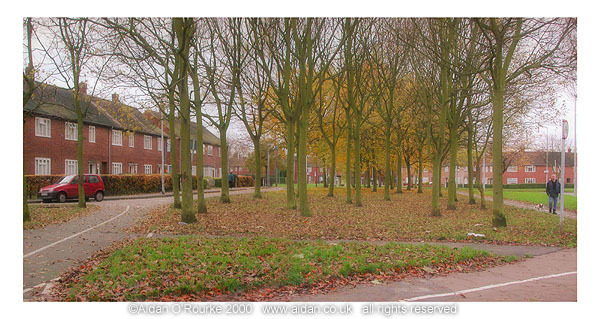 WYTHENSHAWE has many attractive trees and green spaces, such as this one, close to the Forum Centre. It's a pity the design of the houses wasn't made more interesting and varied, as in the garden village of Port Sunlight, on the Wirral. When the planners of Manchester Corporation conceived Wythenshawe new town in the 1920's, their intention was to better the lot of the slum dwellers of Manchester by moving them out of the city into spacious houses set amongst open spaces and trees. Wythenshawe still has a bad reputation in the minds of many people, though recently, some showbiz people have emerged from here: Film director John McCormack, grew up on Panfield Road, and Caroline Ahern, creator of Mrs Merton and "The Royle Family", is also from here. 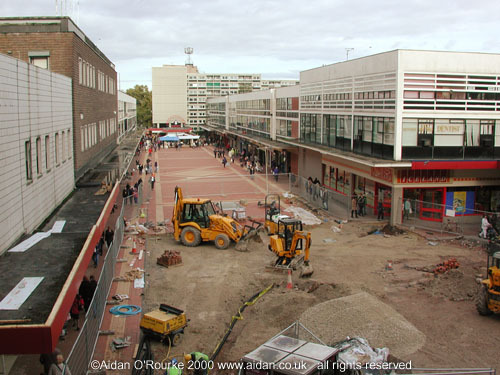 WYTHENSHAWE'S CENTRAL SHOPPING PRECINCT must one of the least attractive in the Manchester area - its glass and concrete facades, rectangular windows and exterior tiles are typical of 1960's urban planning. I wonder what difference new surfacing will make to this scene. Despite the ugliness of the surroundings, and the relative poverty of many of the local people, their indominable spirit gives this place a lively and colourful character. THE FORUM CENTRE is the main focus for education and cultural activities in Wythenshawe, Europe's biggest council estate. The Centre contains a library, theatre halls and other facilities. It's well-used, but like much of the centre of Wythenshawe, its 1960's style architecture is dull and uninspiring. 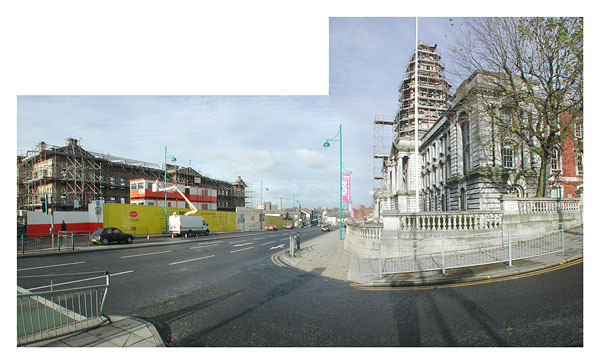 If the Forum Centre was being developed in 2000, I wonder what it would look like. 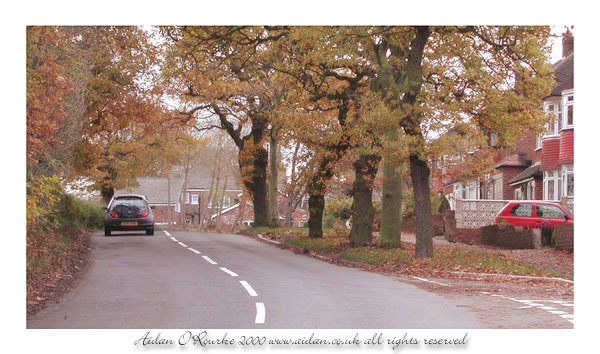 BROOKS DRIVE is an ancient tree-lined by-way which runs from the A538 Hale Road, Hale Barns, about half a mile west of the M56 junction, to the roundabout near Timperley, where Brooklands Road meets the A560 Altrincham Road. 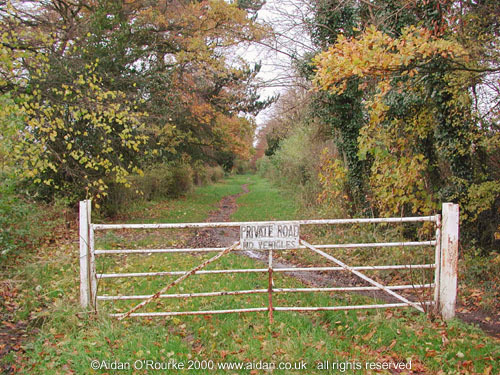 Nowadays, the drive is mostly muddy and overgrown, though at the Hale Barns end, it's a private cul de sac. 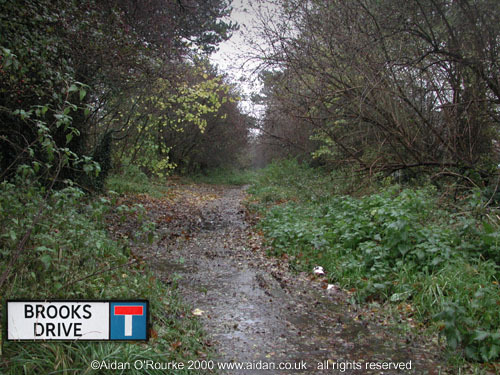 I'm told that in past centuries Brooks Drive was used by stagecoaches - in any event, it was much more important in times past than it is now. When developers proposed to build on it, there was a campaign to have it protected and developed as a public amenity. 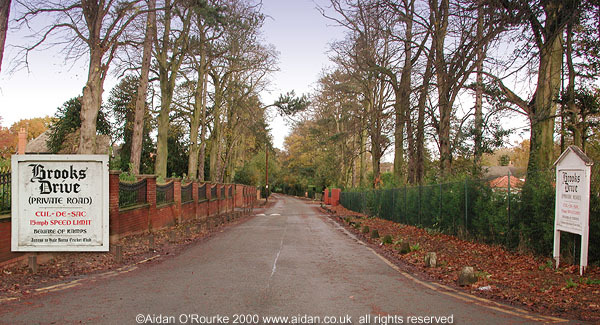 SHAY LANE meanders across a stretch of open countryside that separates Wythenshawe, Europe's biggest council run estate, from Hale Barns, one of the most affluent suburbs in the country. Leaving behind Wythenshawe's plain council dwellings, it's not long before you see the affluent semi-detached houses standing on the edge of the conurbation, overlooking fields. These houses date from the 1930's, but the trees have been there a lot longer. It's mid-November 2000, and they are shedding their leaves, giving an autumnal feel to the scene. 'LEAFY' is a word often used to describe the affluent suburbs of English towns and cities. 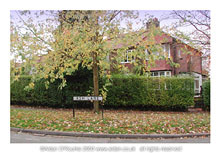 With their hedges, trees, grassy verges and red brick semis, scenes like this represent a suburban idyll which came into being with the promotion of privately-built estates in the 1920's and thirties. This could be Ruislip, Surrey or Birmingham. In fact, it's Hale Barns, about 10 miles south of Manchester city centre. 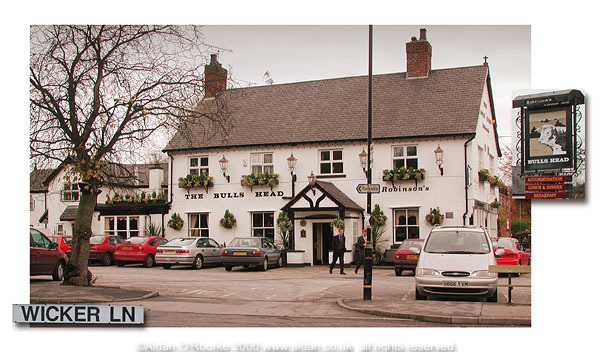 THE BULL'S HEAD is situated at the top of the interestingly named Wicker Lane, in Hale Barns, one of the most affluent suburbs in the Manchester area. This Robinson's owned pub has preserved its traditional name and look, unlike other pubs in the area.Wythenshawe, seems a long way away, even though it's only ten minutes away by car. "The Bull" is a regular performance venue for singer, entertainer and actor Malcolm Pitt (another Wythenshawe lad). WELLINGTON ROAD SOUTH, Stockport in autumn 2000 is the scene of redevelopment. In the left of the picture, the old infirmary, a listed building, has been demolished, apart from its classical facade. A complex of luxury apartments is under construction behind it. On the other side of the road, the neo-baroque tower of Stockport Town Hall, built in the first decade of the 20th century, is undergoing renovation. Stockport Infirmary was closed in the 1990's as part of the move towards larger single-site hospitals - Services here moved three miles south to Stepping Hill. The town hall has been extended to the rear, but the original building remains intact. Thanks to sympathetic development, this location will maintain its historic character. The only element to mar the scene are the ugly and visually intrusive new lampposts. 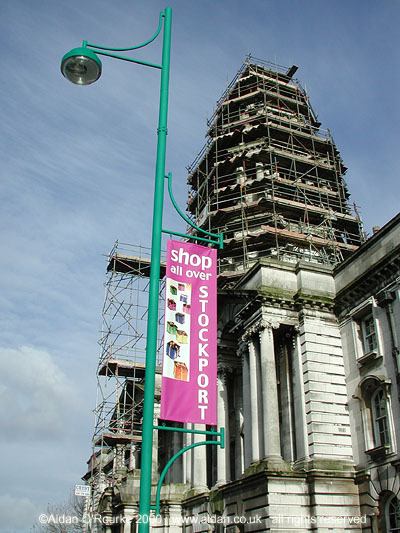 THE NEO-BAROQUE tower of Stockport Town Hall is shrouded in scaffolding while it undergoes essential renovation work. After nearly a century of exposure to the elements, the stone is being cleaned and improved. Meanwhile, along Wellington Road South, an ugly new design of street lamp has made its appearance. The previous ones, put up in the early 1970's, were sleek and grey and tended to blend into the surroundings. These ones scream out at you, in day-glo green with their 'Everything for a Quid'-store design. The local council's ad banner also hides part of the facade, adding another unnecessary visual element to an over-crowded streetscape. SYKES RESERVOIRS are situated in the Stockport suburb of Edgeley, next to Alexandra Park. They were created in the 1850's to serve Syke's Bleach Works, which was established in 1793 by William Sykes. At that time, weavers from the local districts of Adswood, Stockport, Edgeley, Cheadle and Cheadle Hulme brought their cloth here, where it was bleached and sold on by William Sykes. Sykes and Co closed in 1986, the works was demolished and the land was given over for new housing. 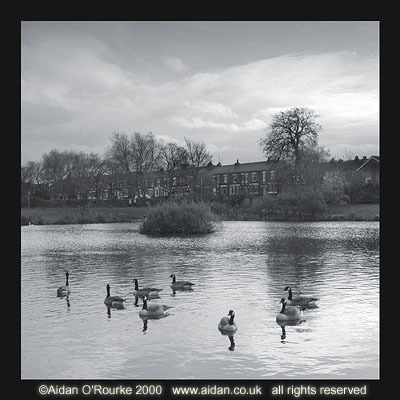 The reservoirs have been landscaped by Stockport Metropolitan Borough Council, and are now used by fishermen, model boat enthusiasts and a large variety of waterfowl. As a child I lived close to here and remember the reservoirs when they were surrounded by a metal railings, which I longed to climb through, as well as the enormous chimney, taken down at the same time as the bleach works were demolished.